I had the most WONDERFUL weekend! 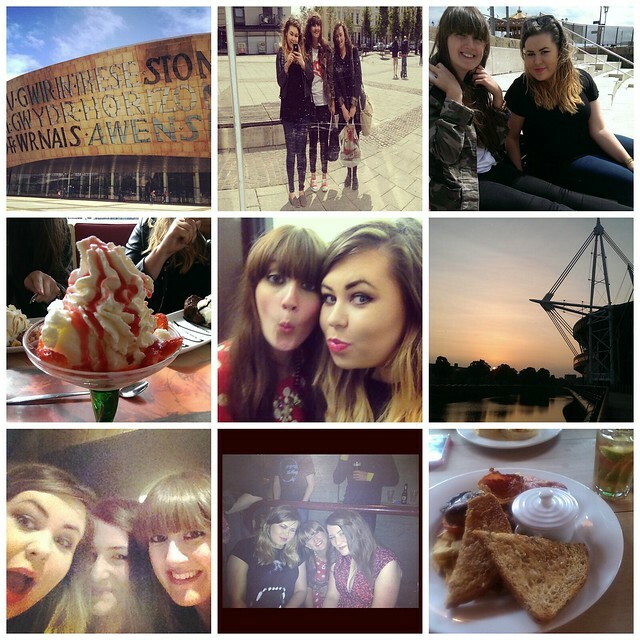 Two of my favourite ladies came to stay in Cardiff so I go to play host and show them around my city. Sophie and Emma both arrived on Saturday and we were far too busy eating, drinking and dancing to take photos so I've borrowed these ones from the girls instagram feed. We headed down to Cardiff bay and sat in the Roald Dahl Plass for a bit of shelter from the wind and ate our lovely picnic that M&S provided which included the most delicious butternut squash dip, tasty sliced meats and deli dishes. Yum! If you live in Cardiff and fancy winning a gourmet picnic for four people be sure to check out the M&S twitter account this weekend. You will need to follow the clues on twitter and the tag #PicnicTreasureHunt to figure out the mystery location and be in with a chance of winning. They have already been in Edinburgh and Newcastle so your city might be next. Obviously huge amounts of nibbles wasn't enough for greedy ol' me so we headed to Cadwaladers ice cream parlour for a tradition ice cream sundae. Apparently the vanilla ice cream has a secret recipe, including the addition of 6 lbs of "shan't tell you" and "a great deal of love and care." Cute! I rolled back to the hotel after all this food. After some drinks in our hotel room we headed into town and danced the night away in Clwb Ifor Bach to some cheesy pop on the ground floor and the indie disco upstairs. I like to think that people in Cardiff showed the girls some nice Welsh hospitality. We ended up in McDondals at 4am so it was obviously a good night. Looks like a lot of fun. I want that icecream. I had the best weekend Gem - thanks for being such an amazing host! I want to come back soon!